Absolute bargain due to the miles, But what a gem of a car. Looking at it you wouldn't believe it had covered half the miles it has. Clearly been someones pride and joy. The mileage is supported by the no expense spared full BMW service history. The wheel are unmarked and have 4 virtually new Michelin Pilot tyre's on. Prefect for the family with 4 doors and a massive boot HA, HA. This car is an absolute monster if you what it to be and being a very rare manual gearbox you can really drive it how your what to. Running on 18" BMW M3 Alloys which give a far more enjoyable ride and better handling. Fully equip with I-Drive, Sat-Nav, dual climate control, electric memory seats, full grey leather interior, multi-function steering wheel with M button, electric windows, CD system, air conditioning, front and rear parking sensors with on screen and much more. This car needs to be seen to be believed. We offer great finance packages to suit all budgets and credit scores good or bad. Simply click on the finance link on our homepage and fill out a proposal and we will do the rest. All Finance Rates Subject to T&Cs. Any Part Exchange welcome. For more information please call our office on 01202 258156 or Hayden on 07843 087334 or Darren on 07971 289371. Please visit us at Bournemouth and Poole Car Sales 540 Ringwood Road. Poole. Dorset. BH12 4LY. What an outstanding example of the classic BMW M3 Convertible. It's an absolute weapon to drive and has all the extras you would expect including Full Black Leather Interior, Sat-Nav, TV, 19" BMW alloy wheels, heated electric memory seats, paddle-shift, SMG-2 gearbox, cruise control, electric folding mirrors, Harmon Kardon sound system, CD system, electric windows and mirrors and of course the electric power roof. Got to be seen to be fully appreciated. We offer great finance packages to suit all budgets and credit scores good or bad. Simply click on the finance link on our homepage and fill out a proposal and we will do the rest. All Finance Rates Subject to T&Cs. Any Part Exchange welcome. For more information please call our office on 01202 258156 or Hayden on 07843 087334 or Darren on 07971 289371. Please visit us at Bournemouth and Poole Car Sales 540 Ringwood Road. Poole. Dorset. BH12 4LY. FINANCE ARRANGED. 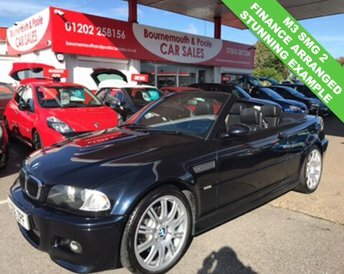 4 wheel drive version presented in excellent condition throughout. Specification includes Alcantara suede sport interior, dual climate control, heated front seats, stop/start option, front and rear parking sensors, Isofix, electric lumbar supports, AUX point, front armrest, 17 inch M Sport alloy wheels, 6 speed gearbox, automatic lights, 4 electric windows, heated electric mirrors, remote central locking, alarm/immob, multiple airbags and much more. We offer great finance packages to suit all budgets and credit scores good or bad. Simply click on the finance link on our homepage and fill out a proposal and we will do the rest. All Finance Rates Subject to T&Cs. Any Part Exchange welcome. For more information please call our office on 01202 258156 or Hayden on 07843 087334 or Darren on 07971 289371. Please visit us at Bournemouth and Poole Car Sales 540 Ringwood Road. Poole. Dorset. BH12 4LY. FINANCE ARRANGED. 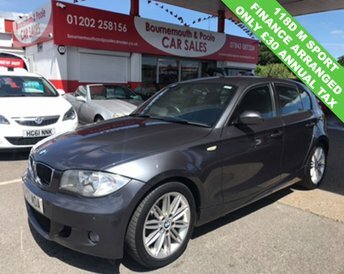 Smart looking 1 series coupe offered in excellent condition throughout. Specification includes half black leather interior, front and rear parking sensors, Bluetooth, rear privacy glass, 17 inch M Sport alloy wheels, white interior trim, dual climate control, AUX and USB points, BMW Professional radio/cd system, electric heated mirrors, 6 speed gearbox, front armrest, stop/start option, Isofix, multiple airbags, alarm/immob, remote central locking and much more. We offer great finance packages to suit all budgets and credit scores good or bad. Simply click on the finance link on our homepage and fill out a proposal and we will do the rest. All Finance Rates Subject to T&Cs. Any Part Exchange welcome. For more information please call our office on 01202 258156 or Hayden on 07843 087334 or Darren on 07971 289371. Please visit us at Bournemouth and Poole Car Sales 540 Ringwood Road. Poole. Dorset. BH12 4LY. 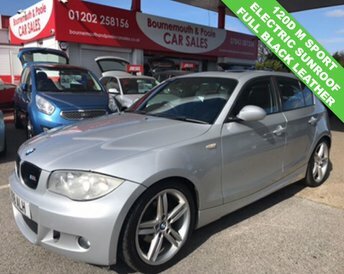 Smart looking M Sport 120D offered in excellent condition throughout with full service history. Only £30 per year to tax and offering massive mpg make the BMW 1 series diesel still a top selling hatch back. Features include half black leather interior, front and rear parking sensors, dual climate control, optional start/stop, 6 speed gearbox, front armrest, 4 electric windows, Isofix, M Sport steering wheel, gear knob and alloy wheels, 4 electric windows, auto lights, AUX, radio/cd system, remote central locking, alarm/immob, multiple airbags and much more. We offer great finance packages to suit all budgets and credit scores good or bad. Simply click on the finance link on our homepage and fill out a proposal and we will do the rest. All Finance Rates Subject to T&Cs. Any Part Exchange welcome. For more information please call our office on 01202 258156 or Hayden on 07843 087334 or Darren on 07971 289371. Please visit us at Bournemouth and Poole Car Sales 540 Ringwood Road. Poole. Dorset. BH12 4LY. 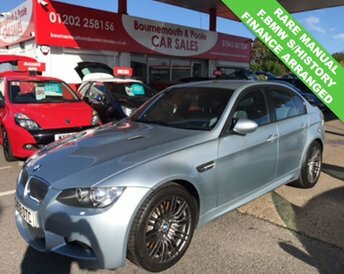 Bournemouth and Poole Car Sales is the best place to find great deals on used BMW cars for sale in Poole. With years of experience helping motorists to track down their dream vehicles, our team is well placed to make sure you find a used BMW to suit your budget and lifestyle. Outstanding deals are available on nearly new hatchback models such as the BMW 1 Series, as well as stunning two-door rear-wheel drive coupés like the BMW 4 Series. All of our used BMW cars are given a thorough inspection before arriving on the forecourt, so you can drive away with complete peace of mind. Browse our latest range of used cars now.